The game is played in two teams. The goal for each player is to get their team to say the word or word phrase displayed in the disc. 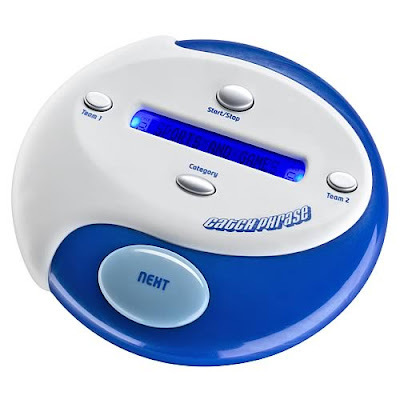 One member of a team starts the timer and tries to get his or her team to guess the displayed word or phrase. A clue-giver can make any physical gesture and give almost any verbal clue, but may not say a word that rhymes with any of the words, give the first letter of a word, say the number of syllables, or say part of any word in the clue (e.g., “worry” for “worry wart”). When the team guesses correctly, the other team takes its turn. Play continues until the timer runs out. The team not holding the disc when time runs out scores a point. They also have one chance to guess the word or phrase, with team members allowed to confer; a correct answer earns a bonus point. The first team to score seven points wins. Apparently, in this particular game, she has decided that she will be the giver of the clues. And since we were all being entertained immensely, we went with that. When we actually played a real game, “Mammals” was the go-to answer when we didn’t know what else to say.